Micro-Epsilon: During surface finishing of strip material, the color sensor system used must meet high requirements in terms of precision and speed. In order to detect color shades with an accuracy of ΔE <0.1, the colorCONTROL ACS7000 color measuring system from Micro-Epsilon is used. 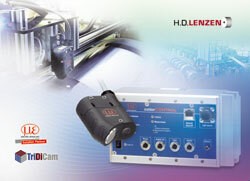 It is directly integrated in the production line and operates with high precision and speed.